The Seattle General Strike of 1919 started 100 years ago today, on 06-February-1919. Several shipyard unions had gone on strike for better wages, including unions affiliated with the American Federation of Labor (AFL) and the Industrial Workers of the World (IWW). Shipyard owners resisted strongly and striking workers appealed to the Seattle Central Labor Council. Many unions also went on strike. The general strike lasted five days. City Virtually at Standstill as Big Walkout Is Staged. Seattle Wash., Feb. 6. 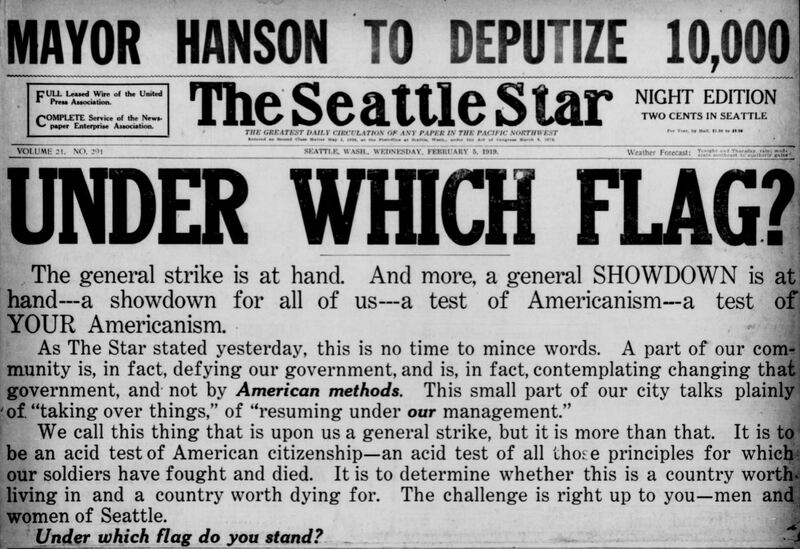 -- Seattle's general strike was called at the scheduled time, 10 a.m. today. First reports rom the downtown section said union street car men started their cars for the barns at 10 o clock, union elevators in all the large buildings abandoned their cars and restaurants closed their doors when their union cooks and waiters left. Most of the city stores announced they would remain open as long as their stocks lasted. They will be unable to replenish them as the truck drivers are striking. Telephone operators remained at their posts, according to reports. Seattle expects to have lights tonight as the strike committee of the Central Labor council exempted the engineers in the municipal lighting plants from the strike order. Schools may he closed because of the strike of janitors and engineers, the superintendent of schools stated. Moving picture houses will be crippled by the strike of operators. Today's walkout was called by the Seattle Central Labor council as a sympathetic move to help shipyard workers who, numbering 25,000 struck for higher pay Jan. 21. I think that the post-WWI era had wage increases, so maybe the strikers won this one. Hi Nick. The strike fell apart after the mayor brought in more police and soldiers and the unions put pressure on the workers. I hope to have another article ready tomorrow.